The European Neighbourhood Council (ENC) is glad to introduce the third analysis of the new feature entitled “ENC Analysis “. The latter will display analyses by our Academic Council Members and External Advisors on relevant topics regarding the European Neighbourhood Policy (ENP) area and wider Europe. 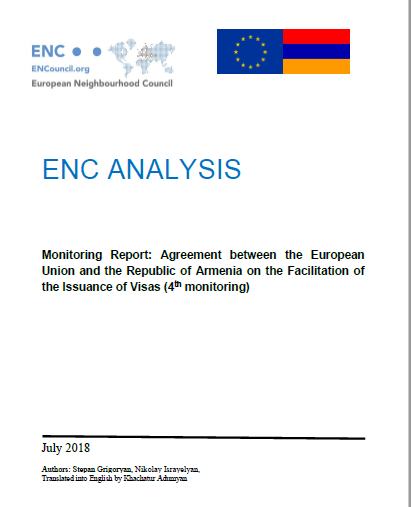 This ENC Analysis features the opinion of Stepan Grigoryan and Nikolay Israyelyan on the facilitation of the issuance of visas as part of EU-Armenia relations. The final objective of the study is to develop the EU-Armenia relationship and serve as a basis for launching the EU-Armenia visa dialogue and subsequently reaching a visa-free regime.